Megan Leavey tells the true story of the real-life title character, who was a Marine deployed to the Middle East with her bomb-sniffing dog, Rex. Megan ends up very attached to Rex, and eventually ends up wanting to adopt him; however, the Marines try to stand in the way of this. 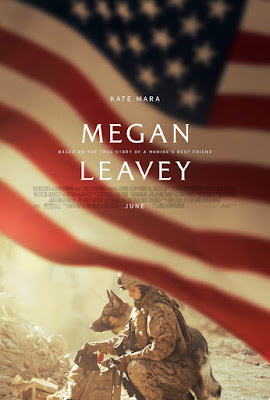 Megan Leavey (Kate Mara) doesn't have much going for her in her hometown, and seemingly on the spur of the moment, she decides to join the Marines. She finds a home there, though she still gets in trouble for doing stupid stuff. When she finds out about the K9 program, which includes bomb-sniffing dogs, she pulls herself together and eventually applies and receives a German Shepherd, Rex, who is a bit of a "problem dog"; he bites people and barks at everyone. Megan and Rex eventually bond, however, and are deployed to the Middle East. When Megan eventually decides not to re-enlist in the Marines when her tour is over, she wants to adopt Rex, but instead Rex gets sent back to the Middle East. This film has an A-list cast, some of whom are almost unrecognizable. Mara is great as Megan Leavey, and Bradley Whitford (The West Wing) plays her father, who is divorced from her mother (played by Edie Falco). Tom Felton (aka Malfoy from the Harry Potter series) has a small but important role as a fellow Marine who recently got back from the Middle East, and Common plays Gunny Martin, Leavey's commander in the K9 program. Ramon Rodriguez (Transformers: Revenge of the Fallen) also has a guest role, as a fellow Marine who takes an interest in Leavey. Yes, see this movie, and bring Kleenex. Dog-lovers, especially, will take an interest in this movie, but it's sad to see how "lost" the dogs become when they make it home and their owners do not (and no, that's not a spoiler about the main character). I always like true stories, as well, and from what I can tell, the movie sticks closely to the real Leavey's life, including a part at the end when she's honored by her favorite baseball team, the Yankees. I also barely checked my watch during the film, which to me is the mark of an engrossing movie. This film should do well at the box office because of its cast, but it's one that is definitely worth seeing regardless. Megan Leavey is in theaters today, June 9th, and is rated PG-13 with a runtime of 116 minutes. 4 stars out of 5.